One of the best gifts I received at my baby shower wasn’t on my registry. It wasn’t adorable, or baby-sized, or cute and cuddly, or even something you’d find in the baby section of a store. It was a folder. And it was the best baby shower gift ever! A folder with a place for every piece of paper that had been accumulating on my desk related to a baby that hadn’t even been born yet…and with places for very important pieces of paper we’d be receiving in those exhausting hours, days, and sleep-deprived weeks following the birth of our little one. For someone like me that loves organization but isn’t very good at implementing or maintaining it even on my best days, this was a perfect gift. It was a wonderful way to ensure that all those pieces of paper had a home without even having to think about it…and in a small but significant way, it helped to bring my stress level down before and after our baby was born, knowing where to put and where to find all those very important pieces of paper (and there are so many!). Are you planning a baby shower? 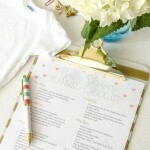 Grab a FREE Baby Shower Planning Checklist to help you with each step along the way! I have now put together three of these folders to gift to friends and plan to make one for every baby shower I ever attend! An accordion file with 12 pockets. 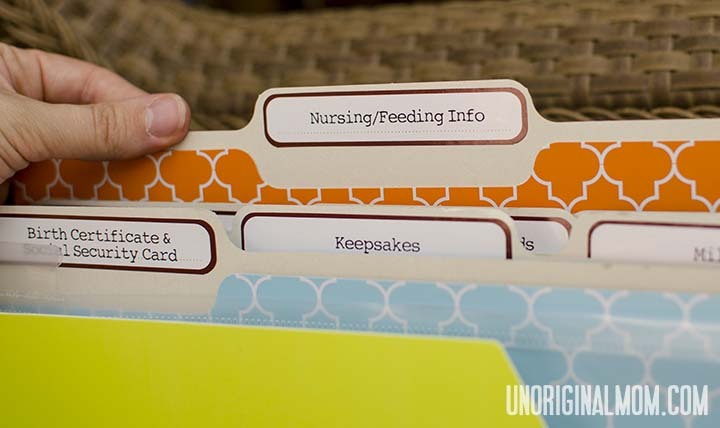 You could also put the file folders in a small hanging file box (they had some really cute ones at Target and I was tempted)…but I found it really helpful for the folder to be easily portable in those first weeks, to take to the hospital and to doctor’s appointments. I’ve now transferred a lot of the folders to our filing cabinet. That’s it! 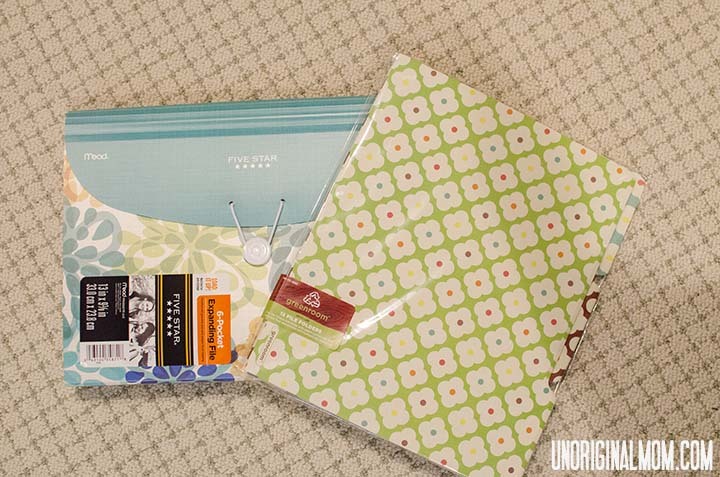 Of course, you can decorate or personalize the folder if you’d like, but you certainly don’t have to. 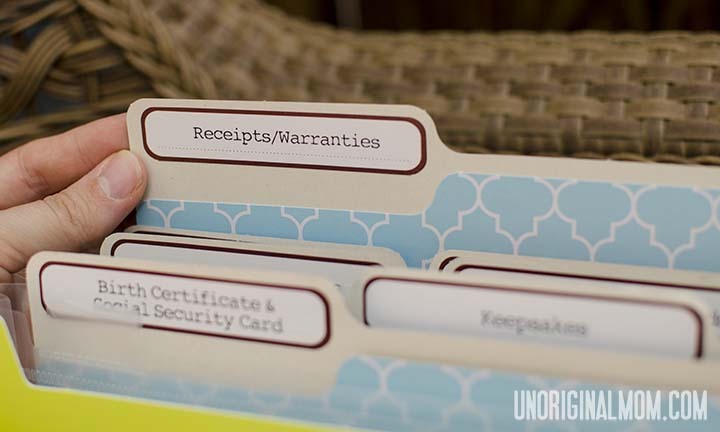 If you want to print labels to put on the folders instead of handwriting them, make sure you buy ones that come with labels or purchase the labels separately. (The folders I got from Target actually came with labels to print on – the ones from Staples did not.) Other options would be a label maker, trim down any size larger labels you have on hand to fit, or neatly handwrite on the tabs yourself. If you have a Silhouette machine, see how I did a quick print-and-cut to make my labels with clear sticker paper in this post! Assemble your folder, and you’re good to go! I hope this idea will help you bless a new-mom-to-be! ARE YOU PLANNING A BABY SHOWER? Sure, you can find lots of ideas on Pinterest…but how great would it be to have everything you need in one place? The Baby Shower Book is a comprehensive and easy to read Baby Shower planning handbook, plus it includes a printable toolkit, organizing tips, and lots of crafty inspiration. 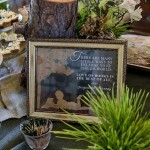 You’ll also find TWENTY printable baby shower games in a beautiful, trendy, gender neutral design! 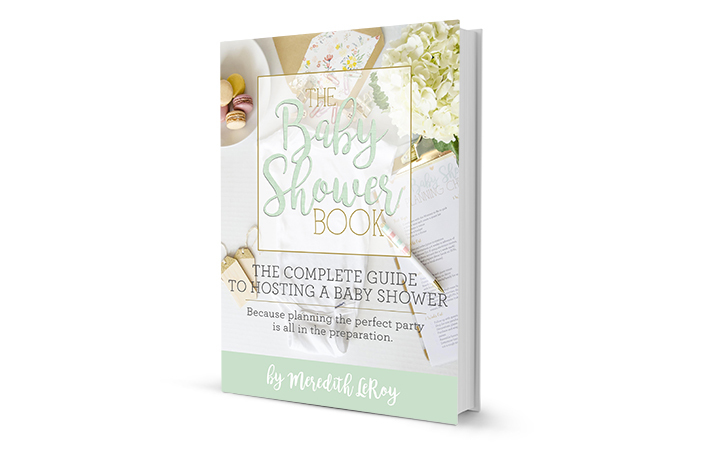 If you are planning a baby shower, you simply must check out The Baby Shower Book, your all-in-one guide to hosting the perfect baby shower! I hope you’ll stop over to take a look at all the amazing printables that are included along with the eBook. I promise it will make your planning much smoother – and your end result simply wonderful! 103 Responses to Best Baby Shower Gift Ever! This is such a great idea! I really could have used one of these with my kiddos – heck, I could still use one! 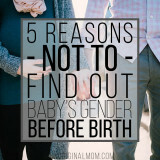 I’m going to have to keep this in mind for baby showers! I LOVE THE ONE YOU MADE FOR ME! :) Thank you !!! So glad you like it! It was a lifesaver for me, I hope it is useful for you too! Still thinking of you and wishing you a fast and comfortable last month and a half! This is such a great idea! I just might make this for myself, and I will definitely be doing one for my next preggo friend. This is a fantastic idea! I’ve pinned it so I can make some for upcoming baby showers. Awesome idea! My pile of baby paperwork was in a pile on a shelf for the longest time, and I had no idea what to do with it. This would have been wonderful! Thanks, Bethany! 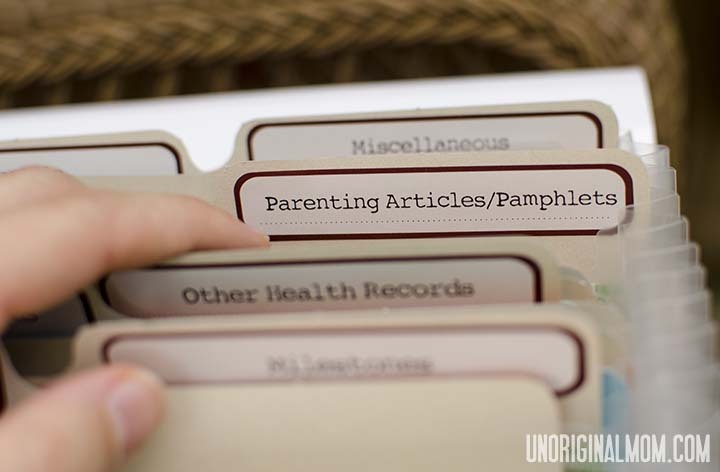 It was SO helpful to have a place for all those papers before the baby was even born…otherwise I know it would have been a gigantic mess that I’d still be trying to get organized! Oh, so, so cute! And who doesn’t love cute organization? Can’t wait to make something like this one day! Saw this on ladybug blessings. Thanks for sharing! What a great idea! I remember being so out of it when my second was born that I just crammed all that paperwork into a giant envelope and then had to spread it all out at each Dr. visit, insurance call, etc. Something like this would have been so handy! 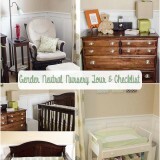 Yes, organization is definitely not something one thinks about as a sleep deprived new mom! It is so handy to be able to just grab the entire folder and take it with you to the dr’s office, or wherever! This is a GENIUS idea!! I love it! We’ll be featuring this over at Someday Crafts tomorrow, so come check it out if you have a minute! I think it’s cute that the name of your blog is ‘Unoriginal Mom’ but that I have never ever hear of or seen anything like this! Such an awesome idea! I just love practical shower gifts! This is a great baby gift idea! Pinning it now and hoping to make it for my next baby shower gift! Thanks Carrie! I’m sure the mom-to-be will love it! This is a great idea for a gift. I’ve never thought about that. I’d love for you to check out our Pattern Party! Those with free patterns and templates to share are invited to link up! Starts on the 1st of each month. That is a great idea! In the fog of life after a baby is born it can be hard to think of things like where to stash the important documents. It would be very helpful to have something like that all set up for you! Thanks for sharing at A Crafty Soiree and please consider doing a guest post! I’d love to have you. Tell me about it…it’s still amazing to me how much STUFF accumulates with such a little person! 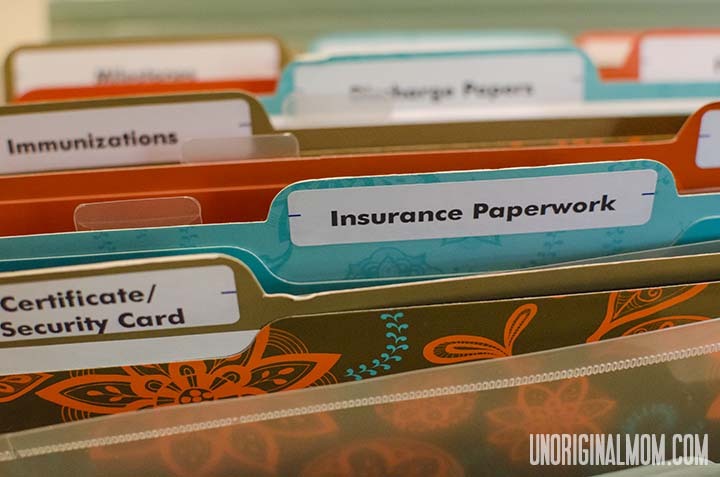 The great thing about the labeled file folders inside of the accordion folder is that it’s portable when they’re brand new…but as they start to accumulate more and more paperwork, you can transfer the file folders to hanging folders in a file cabinet. I had to transfer the “manuals” folder to the file cabinet almost immediately, with all the thick manuals for baby stuff we got! Wow! This is such a great idea and great gift! 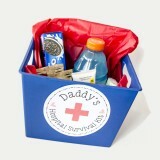 Now, this IS a great shower gift idea, and original to boot! I have a shower coming up next weekend, and would love to receive this as a gift. It’s so much better than a thousand swaddle blankets and washcloths. What a wonderful idea! My shower is next weekend and if I opened something like this I would be in heaven. Starts you off on the right foot! This is such a fabulous idea!! So unique! Thanks so much for coming out to the party at The Inspiration Exchange. Pinned this! Haha I think there’s some inner-organizing-nerd in us all :-) Glad you like it! Thanks for stopping by! You are right, this gift is GENIUS and perfect for a first time Mother! Thank you for sharing on Blog Stalking Thursday! I have featured your project on Blog Stalking Thursday Features YOU! The post is going live later tonight. I would love for you to stop by and grab a feature button. Thanks again for sharing! Visiting from Show and Share Wednesday! I just have to leave another comment because I think these are so amazing. Made two today for my friend who is having twins….and man, I wish someone had made them for ME! I’m planning on making these for a friend with twins on the way; did you use these same labels, or did you have any twin specific labels? Thanks! Of course! Thanks for trying it out!! This is a great idea! Since I will be throwing my friend a baby shower, I was undecided on a gift. Wanted to give her something not too expensive. 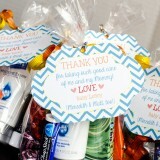 That is one of the reasons I LOVE giving this gift – it is so inexpensive! But it is still special because it is not something you can buy in a store, and is so useful! Lucky me! I have a baby shower coming up next month! Looks like I just found my gift! Jumping over from Happy Hour! So…as you already know, Meredith, I LOVE this project of yours and just had to feature it in my round-up of 16 DIY Baby Shower Gift Ideas. Feel free to stop by and check it out anytime! Thanks for the post – i saw it at The Thinking Closet and adapted it a bit. I’m expecting twin grandchildren this summer and made a looseleaf for a shower this week that was much appreciated. Tabed dividers, page protectors and pockets for small items will keep things for both babies in one place and not risk falling out in the car or diaper bag. I had already made them one for household paperwork as a housewarming – great minds think alike :-) Thanks Meredith! Thank you SO much for posting this. Made this for one of my coworkers and she LOVED it. Now I have multiple requests from other future and current moms in the office. This is an amazing idea! I will definitely be using this. Thank you so much for sharing! I LOVE LOVE this idea! I just made it for my friend’s baby shower I will be attending. I hope she likes it just as much as I do. 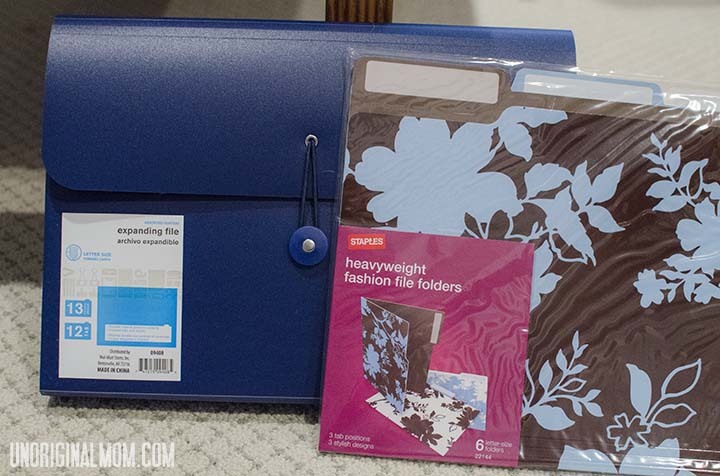 I even found a clear accordion file so the colorful folders (Target as well) show through! Definitely gonna be my go to shower gift in the future as well! Thanks again for sharing!!! What a fantastic idea. And what a thoughtful friend for thinking of such a helpful gift. I could definitely have done with something like that because I have paperwork scattered all over my house. Thanks Alena! Glad to know that it is helpful for other folks, too, because it certainly has been a life save for me! Could you make some of these, after the birth of my little girl (Wednesday!) I see that I could really use one. If you are open to make more than one for me, I’d like to ask for 3. I’ll pay!let me know what you think. I looked on Etsy and can’t find anyone making them :-(. Hi Claudia, congratulations on your little girl! I don’t make these to sell, but you could so easily make one yourself if you just pick up an accordion file and a pack of file folders…or maybe a friend could pick some up for you from the store? They are so easy! Hope you are enjoying the first days with your new little one! Thank you so much for this amazing idea! I made one for my friend’s shower yesterday and it was a huge hit! She even asked if I could make one for her older baby too :) I had found some gorgeous teal patterned files and a transparent white folder that allowed the color to come through, then put the baby’s name on the outside with big stick-on letters. I think this has become my go-to shower gift from now on! Yay, I’m so glad she liked it! That folder sounds gorgeous too, great finds! 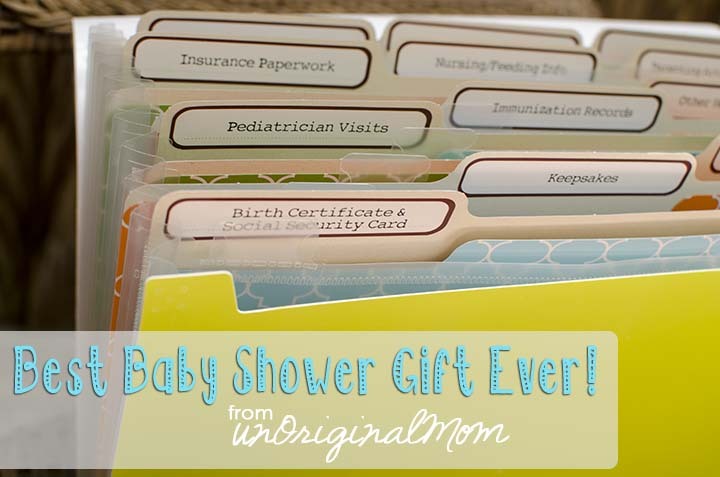 I have made so many of these now…they’re definitely a great “go-to” gift for showers, especially if you personalize them! I wish I had recieved one of these as a baby gift would have stopped me from losing all my stuff all the time. What a great idea! This is a brilliant idea! Thank you so much. I can not wait to give it as a gift. Hi Meredith, my on the go baby shower gift is baby thermometer (from http://thermee.net) because for me this is practical and useful gift. I wish I have talent like you to create things like this. Keep it up! This is fantastic! I’ve told my husband that we need to make one for our kiddo (due next month) and one for each of us. I also have a friend due in April and my nephew’s wife is due in June. Best baby shower gift ever! I always give thermometers, baby Q-Tips and a handmade blanket. This will be added to that group. Thanks Elizabeth! It’s always my go-to gift, too…so practical, but personal too! This is such a brilliant idea!!! I thought I was organised with my first but with all the paperwork, cards and gifts things got a little hectic. I received some beautiful handmade wooden toys from someone and I wish I get things all together as I can’t remember who made it. Oh, I’m so glad to hear that Sarah…I’ve made so many, and they are always such a big hit! I’m so happy that this little idea has served you so well. And congratulations to you – I hope you find this as practical and helpful as I did!! This idea is still going strong. I used it for my niece Jessica’s first son, and now her sister is expecting (baby shower tomorrow), so she gets one, too. I called Jessica first, though to make sure she is actually using the one I got her, and she is. Such a adorable personalized gift. I was just thinking what could I get my sister in law for her baby shower..I’m not sure what present would be best, Actually you helped me a lot…This is more unique, lovely and very important. Certainly cheaper to make your own than the $30 charged for the baby briefcase made elsewhere. This is awesome!! I wonder if we could make one for a wedding gift! Just can’t figure out what labels/folders you’d need. Any ideas? I just found this idea, and am in love with it! I’m making this for a co-worker who is adopting from young couple not ready for parenthood. Im also adding a legal/will/guardian tab; many new moms/dads forget to add those very important documents. 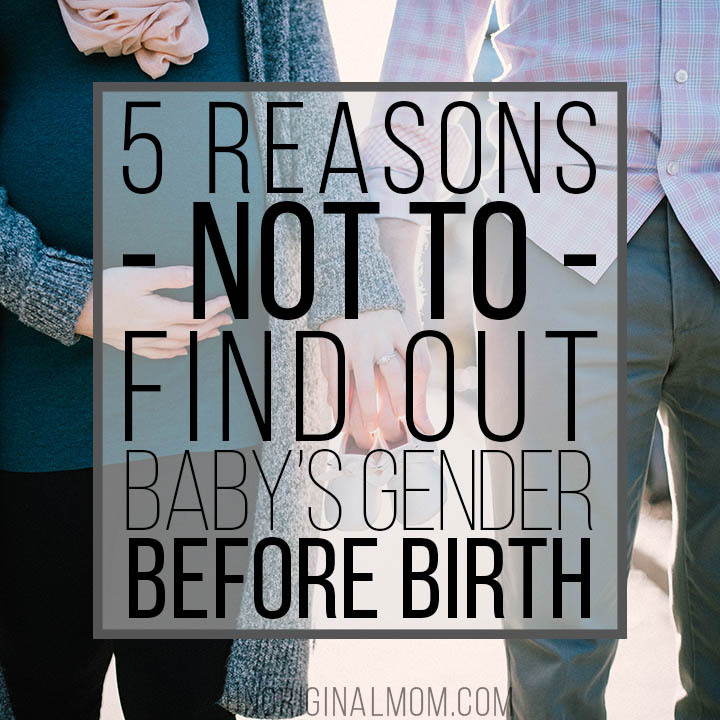 Because of the adoption, she feels like she’s missing out on some of the “nesting” that happens, and this idea will help her with that clued in, included, feeling. How sweet of you! I am sure your co-worker will love it…I still make it for every baby shower I attend, it’s a great and very practical gift. Plus I still use the folder I was gifted with my first baby! Adding that extra tab is a great idea too. I made this as a gift for a friend. 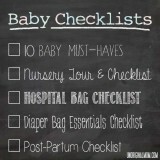 I included some of the list for what to pack for the hospital visit. Baby bag, Mommy bag & Daddy bag. I guess it came in handy when my friend went into labor a month before her due date and Dad had to pack for them all.